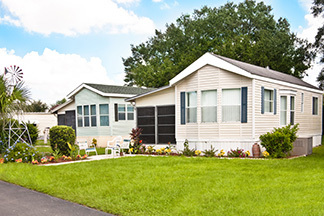 A manufactured home is an affordable and flexible choice. Your mortgage should be, too. Whether you’re looking for a singlewide manufactured home as a starter or a doublewide that fits your entire family, we have a mortgage with low rates and flexible terms. Financing options include a 5-year Adjustable Rate Mortgage, a 10-year or 15-year Fixed-Rate Mortgage or our First-Time Homebuyer's Mortgage program. If the home is 5 years old or newer, the maximum loan term available is 20 years, 15 years if the home is more than 5 years old. Cash-out refinancing is available up to a maximum of 65 percent loan-to-value. The LGFCU Manufactured Home Loan can only be used for a property that has been fixed to a foundation, and has been listed as “real property” by the county tax office. Make sure that the Division of Motor Vehicles destroys the mobile home title. To qualify for this loan, the home you are purchasing must be your primary residence and have been manufactured on or after June 15, 1976. It must be placed on property owned by you, on a permanent foundation with the tongue and wheels removed, and with a sloping roof, not a flat metal roof. Any property you purchase with an LGFCU mortgage must be located in North Carolina, South Carolina, Virginia, Georgia or Tennessee. Choose a way to request your Manufactured Home Loan.